This morning I reviewed the Articles of Faith with Luke and Isabel, then Math. I then sent Luke off to a movie with some friends and took the girls with me on an errand. While in the car Isabel announced to me, "I woke up at 3:29!" Joey and I had no idea. I guess she had a bad dream, woke up Luke, had some Apple Dapples (Apple Dapples = poor man's Apple Jacks) and then played for a few hours. Needless to say, after her Ukulele lesson and when Luke got back from the movie, all four kids had a nap. 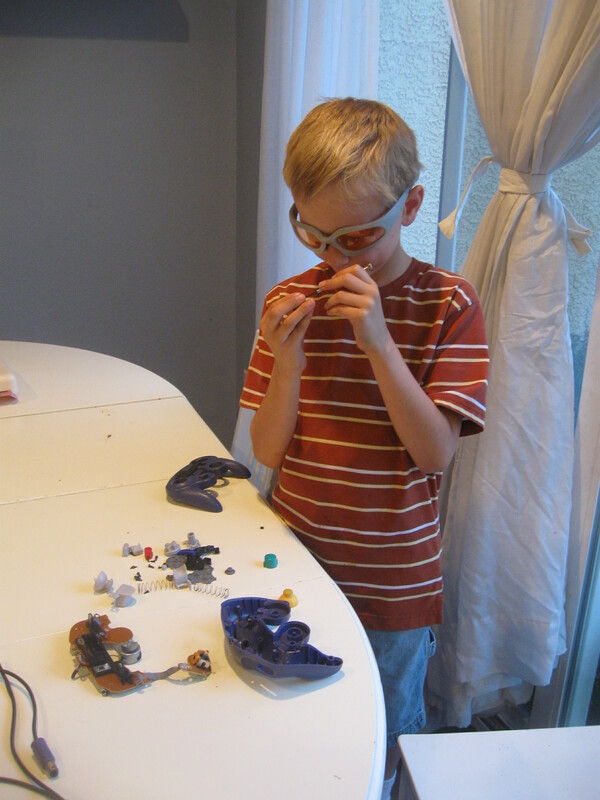 Tonight after Luke's art class, he took apart (after getting permission) his broken video game controller. I love it how Safety Nerd had to have Safety glasses on to unscrew a few screws. He sure likes to find out what's inside of everything. He has had fun dissecting bugs as well. I prefer to not know and assume everything works by magic.